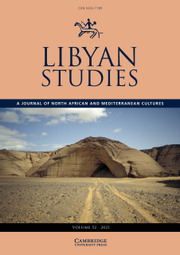 Libyan Studies is the annual journal of record of the Society for Libyan Studies, appearing in November each year. Contributions are peer-reviewed and cover a broad range of subjects, including archaeology, ancient and Islamic history, geology, geography and social sciences. The articles will appeal to readers with an interest in the Middle East and Mediterranean worlds as well as North Africa.